The ZeusMiner Blizzard Scrypt ASIC also available as the GAWMiners Fury is a nice little device that comes at a really attractive price for the hashrate it offers. They are the ideal choice for smaller miners that want to get a Scrypt ASIC miner, but don’t want to spend too much for it… and quite a lot of people like that already have purchased these devices. Being so attractive with their current prices and performance of about 1.3-1.4 MHS it is no wonder people are also interested in modifying them for even higher performance. The simpler thing that you could do is to try to improve the cooling with the addition of some heatsinks directly on top of the 6 ASIC chips to get a little more headroom for increasing the operating frequency with lower number of HW errors. The more complex thing is to try to do a voltage modification in order to allow for the chips to have no trouble operating at higher frequency. People that have used or still use the smaller 5-chip Gridseed Scrypt ASICs and have done a voltage modification to them knwo that these small miners were able to handle a significant performance increase without trouble. The reason for that was the fact they they were originally designed to be used for mining both LTC and BTC, thus they could handle higher voltage and operating infrequence easily if you only used them for Scrypt mining. The case with the ZeusMiners however is not the same, it seems that their miners are already pushed quite high in terms of power usage and operating frequency not leaving you with much headroom for experimenting. Voltage modification of a ZeusMiner Blizzard or GAWMiners Fury is possible and can be done with the replacement of resistors just like on the Gridseed ASICs, however the advantage you can get in terms of hashrate increase is not going to be that attractive so that a lot of people would be willing to do it. There is a topic on the Bitcointalk forum where people are trying to modify their devices and are reporting some useful information and their experience and results, so you might want to check that out if you are interested. The ZeusMiner Scrypt ASICs were something that we were anticipating with interest, so we have pre-ordered the smallest ZeusMiner Blizzard Scrypt ASIC last month and this week we finally got our unit. 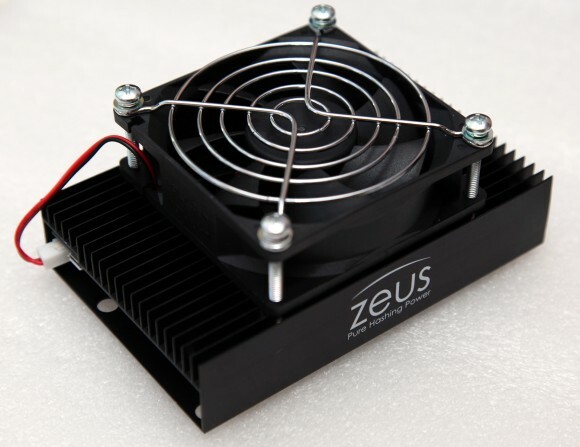 With the initial specifications that Zeus has promised for their Scrypt ASIC miners they were going to be the perfect successor and a replacement for the Gridseed ASICs, and especially the 1.2 MHS Blizzard miner as it was supposed to offer very nice performance at an acceptable price and with low power consumption. 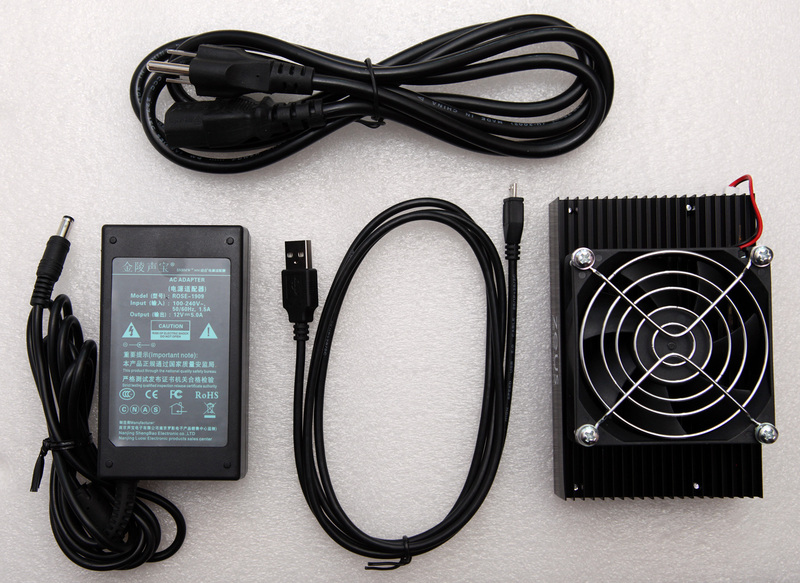 Initially Zeus has promised to deliver 1.2 MHS Scrypt hashrate with a power consumption of just 15W, these were the specifications when we have pre-ordered our Blizzard unit. In the end however it seems that Zeus had some problems with the power efficiency and their miners ended up consuming more than they have anticipated and this is their biggest drawback. Instead of the ZeusMiner chips being more power efficient than the Gridseed in fact they ended up with pretty much the same power consumption or maybe even a bit worse. Their idea is probably to compensate the increased power usage with a better price of the miners for the upcoming batches, but the people that did pre-order early were kind of screwed up as they have paid more for something a bit different than what they got in the end. Don’t get us wrong, but paying $199 USD for a 1.2 MHS Blizzard miner that was supposed to use 15W of power and getting a device that actually uses 44W as our tests have shown for the same hashrate is not great. It is not even double, but triple the power consumption that was initially announced and even though you can squeeze a bit more extra hashrate with just a slight increase in hashrate does not help much in justifying this much of a difference. With all that said, we actually liked the ZeusMiner Blizzard, though we do have some small notes to go along with the complaints about the significant increase in the power usage. These are all pretty much regarding the fact that Zeus needs to start paying a bit more attention to the little details in their miners and this goes not only for the smaller Blizzard, but for the larger and more expensive miners as well. At the moment if you look at the Zeus website you would see that they have updated the specs of the Blizzard to 1.35 MHS with a power consumption of 40W, something that we have actually achieved on our unit, but with about 48W of power consumption. Now, enough with the complaining let us see what you are actually getting with the 1.2 MHS ZeusMiner Blizzard Scrypt ASIC miner. You get a 6-chip ASIC miner with a fan attached over the aluminium cooler, a micro-USB cable for connecting the device to a PC and a power adapter for powering up the device. The rest you can find on their website, namely some brief instructions and the drivers and mining software which is essentially a modified version of an earlier cgminer. Here goes an example of one of the small things that needs more attention – the cable for the power supply is not using the standard used in the country that the miner is being shipped to. Zeus needs to pay attention to these small details – either put a cable for the USA, Europe, UK etc. power standards used or not put a cable at all and tell the buyers to get one prior to receiving the miner. In our case the supplied cable is not for use in Europe, but the good thing is that it is pretty standard cable used by almost all computer power supplies, so it is easy to get one and we have had plenty of these available already. The second small thing that needs some consideration is to at least provide some quick startup guide printed on a piece of paper inside the miner’s box that people get. You cannot expect that everyone is very technical and already knows what he needs to do, how to connect the device and what software to install and use, especially when you do not have a quick startup guide for novice users also available on your website. Other than that you still get pretty much all you need in terms of hardware shipped to you, very well packaged and delivered quickly (once it is shipped) via an express courier service (DHL in our case), though shipping might be a bit expensive, especially for the small Blizzard miners. We’ve had to pay a bit over $50 USD for shipping from China, so Zeus needs to find some partners in other parts of the world such as Europe for example in order for faster and cheaper shipping and no need to pay extra taxes. A quick look at the bottom of the Blizzard shows another thing that needs to be addressed. Note that the screws holding the cooling fan on top of the unit go all the way through the aluminium cooler (the PCB is enclosed inside) and end up with the nuts holding them at the bottom of the unit. So when you place the miner on some surface, instead of the flat aluminium bottom to be resting stable on it, you have only the four screws actually holding the miner. This way they can scratch the surface the miner is placed on, make it not so stable and easy fall dawn as well as cause more noise coming from vibrations caused by the fan on top. The solution for this is very simple – 4 small rubber feet taped on the bottom of the miner. 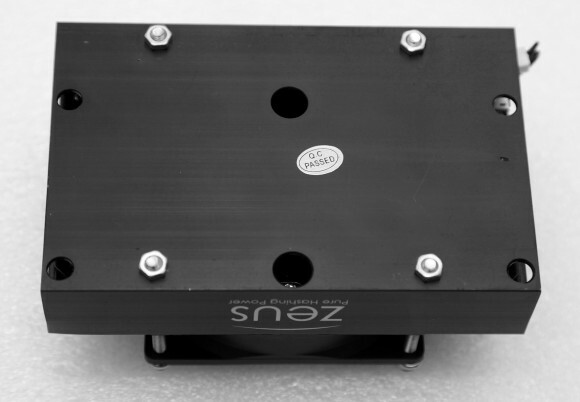 In fact the larger Zeus miners apparently also have the same issue with screws on bottom of the case and no rubber feet and there the vibrations are more serious and cause more noise due to the much larger and more powerful cooling larger fans used. One thing that Zeus needs to work more on for future batches… pay more attention to small details in order to leave customers really happy with their purchase! As we have already mentioned the ZeusMiner Blizzard has 6 ASIC chips inside and was initially rated at 1.2 MHS total, though now it is being advertised as 1.35 MHS. Each chip has 8 cores with each core capable to provide 26.25 KHS hashrate or total 210 KHS per chip at 300 MHz operating frequency or with other words a total of 1260 KHS or 1.26 MHS. We can conclude that the default frequency for the miner is 300 MHz as at this operating frequency the miner can provide the users with the initially promised hashrate. 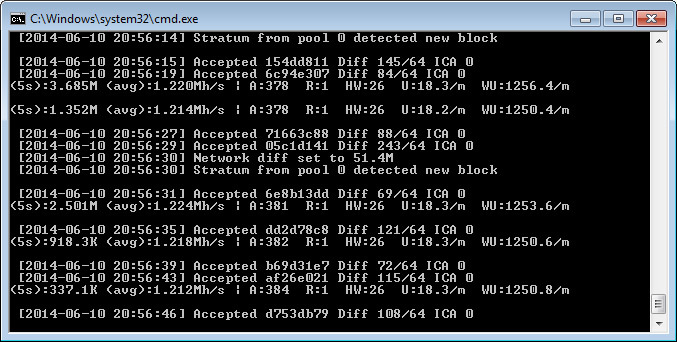 In order to get the new 1.35 MHS hashrate advertised you need to go to 328 MHz as a clock frequency and we were able to get that with no problems. At 300 MHz (1.2 MHS) we have measured 44W of power usage and at 328 MHz (1.35 MHS) the power usage was 48W and in both cases we had the device pretty cool and working stable, though the HW error level was staying a bit high at about 5% in overall on the long run. The power supply you get with the miner is a 60W one (5A at 12V) and is an universal one capable of working between 100 and 240V. It is probably not the most power efficient solution and it does get hot while the device is running, though not hot enough to cause alarms at least for the first 24 hours of operation while we were testing it. We are going to test power efficiency with a better ATX power supply to see if we can get better power usage out of these miners, as well as do some extra testing and measuring of the temperature and optimal clock settings, but we’ll need some more time for these, so expect extra information in the next few days. Here is the situation with hashrate poolside with the miner running at 300 MHz (1.2 MHS), as you can see it is able to deliver the promised hashrate even with the slightly higher percentage of HW errors. Do note that a small percentage of HW errors are common for ASIC miners, you just need to find the optimal balance between the hashrate and the number of HW errors in order to maximize the useable hashrate. Do note that the above results were achieved at the Scryptguild pool mining for DOGE (a coin with higher difficulty and blocks that take some time to solve). If you are mining a Scrypt coin that has block that are solved very fast your actual hashrate may be lower as you might be wasting more time and resources and getting more stale shares, so your actual hashrate can vary based on where, what and how you mine with the device. So what are our first impressions from the ZeusMiner Blizzard in short? We like this little miner, it is well built, easy to setup and works very stable and problem free so far. The initial price might not be that great, but the new price is much more attractive, especially considering the fact that the actual power usage is higher than what was initially expected. Fast delivery and very well packaged, though a bit expensive and needing to pay VAT and some extra custom taxes if ordered directly form Zeus and shipped from China. What Zeus needs to work a bit more on are the little details to make their products perfect in the eyes of the customers – things like a quick start manual in the box, the right power cable for the country the device is shipped to, rubber feet on the bottom of the miner etc. The small ZeusMiner Blizzard miners, also available by GAWMiners as The Fury, are great choice for the average miner that does want to be able to mine Scrypt crypto coins, but not with a GPU. These miners are an affordable and not so powerful Scrypt ASIC that can help spread the hashrate into many normal miners that were using GPUs for mining Scrypt crypto coins up until recently and help keeping the interest and the network distributed among many people. As with the upcoming mega powerful Scrypt ASIC miners there is fear that most of the hashrate will be centralized and in the hands of just a few big mining farms and this will kill the wide user interest.